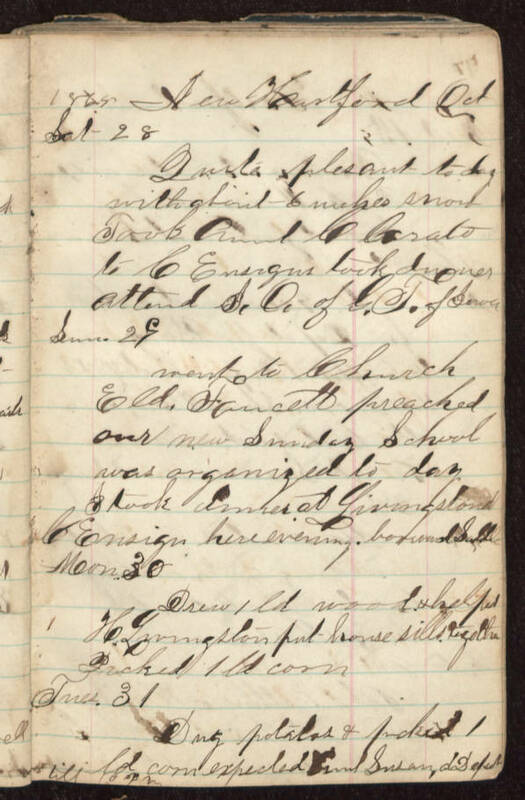 1865 New Hartford Oct Sat 28 Quite pleasant to day with about 6 inches snow Took Aunt C Crato to C Ensigns took dinner Attend "[S?]". O. of G.T. of Iowa Sun 29 went to Church Eld. Faucett preached our new Sunday School was organized to day. I took dinner at Livingstons C Ensign here evning. borrowed Saddle Mon. 30 Drew 1 ld wood & helped H Livingstone put house sills together Picked 1 ld corn Tues. 31 Dug potatos & picked 1 ld corn expected Aunt Susan at Depot till 10 P.m.